Goldenrod and asters (white) dominate during well field years. 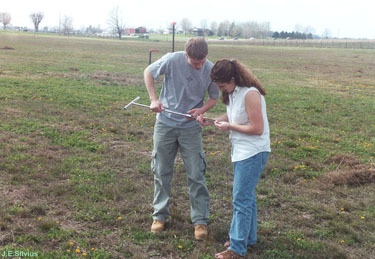 soil core in Spring, 1999 before prairie project began. 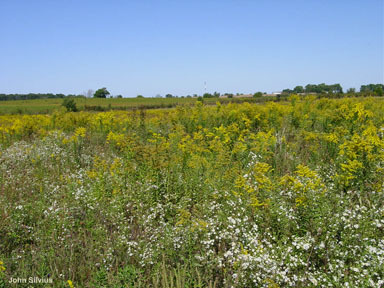 The current Prairie Restoration Site was once part of a 60-acre parcel of farmland purchased by Cedarville College, in 1975. The parcel was partitioned into three land uses as illustrated in the aerial photo taken in Spring, 2005. 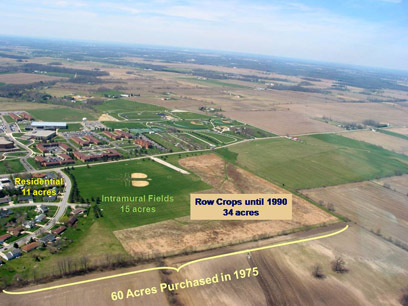 Eleven acres were devoted to residential development (left in photo), 15 acres to intermural sports (left center), and 34 acres to row crops (largely corn and soybeans). The latter, L-shaped portion (center of photo) remained in agricultural usage until 1990. In 1990, Cedarville College switched from dependence upon the village water system for its water supply and developed its own well field in the L-shaped, agricultural portion. Environmental Protection Agency laws prohibited continuation of agricultural activity on the well field, so row cropping ceased and the land was simply mown regularly to control the growth of agricultural weeds. When soil tillage was replaced by mowing, the bare soil became overgrown and annual plants were less able to compete with perennials that can grow from the same well established root systems from year to year. Thus, an ecological succession from annual weeds (e.g. Common Ragweed, Foxtail) in the first years of mowing gradually gave way to the invasion of Goldenrods, Asters, and Bluegrass (see late summer photo on left). The dense clones of these perennials develop by the growth of underground rhizomes. In 1999, we approached the Campus Grounds Department to discuss the possibility of establishing a prairie restoration project on the well field. Although the land was providing for underground water recharge and serving as a low quality habitat for insects, birds, and mammals, it seemed that additional benefits could be achieved without jeopardizing the function of the well field. We were given permission to sow prairie seeds that spring. The photo (bottom, left) was obtained in early Spring, 1999, just prior to the first sowing of prairie seeds in the well field. 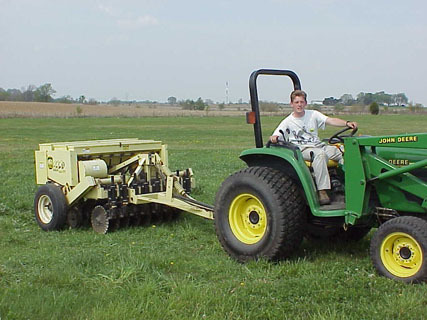 Later in the Spring, seeding was accomplished with a no-tillage drill (shown below) and seed provided by the ODNR Division of Fish and Wildlife. We are much indebted to Mr. Lynn Holtzman, ODNR Wildlife Biologist, for his partnership with us in the project. The OhioEPA standards prohibited use of herbicide (e.g. Glyphosate) to eliminate the competition from existing perennials noted above. The result was a poor response for several successive years of sowing (1999-2002). During these years, we bagan to use fire to promote prairie development. The next page describes our "Prairie Trials by Fire." *Ecological Succession - dynamic changes in a biotic community over time involving populations and their interactions with each other and with the physical environment which also affects and is affected by the changes.